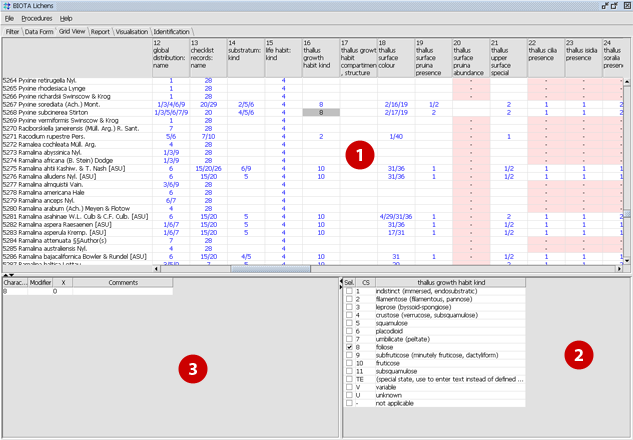 The DiversityDescriptions Grid Editor can display the data of databases that are compatible with the DiversityDescription model. Furthermore you can edit the data very easily. Each row in the grid view (1) shows one dataset/item. The taxonomic Name of the item is shown in the first column. All subsequent coumns display the characters that exist in your project. Each cell shows the selected character state(s) of an item. If you click on a cell, you can enter on ore more character states for each item. This page (revision-1) last changed on 16:31 14-Feb-2007 by unknown.